I love Melbourne for many reasons. One of them is the weekly community farmer’s markets that are held in various spots close to the city. This weekend the monthly Slow Food Market was held at the Abbottsford Convent. The founder of the slow food movement is an Italian, Carlo Petrini, who aspired to counteract the fast pace of life and ensure old traditions relating to food and its provenance were not lost. There is a slow food convivium in Melbourne, which has close ties to the Slow Food Market at the Convent. The Slow Food Market is probably my favourite of all the community markets and it is in a gorgeous location. 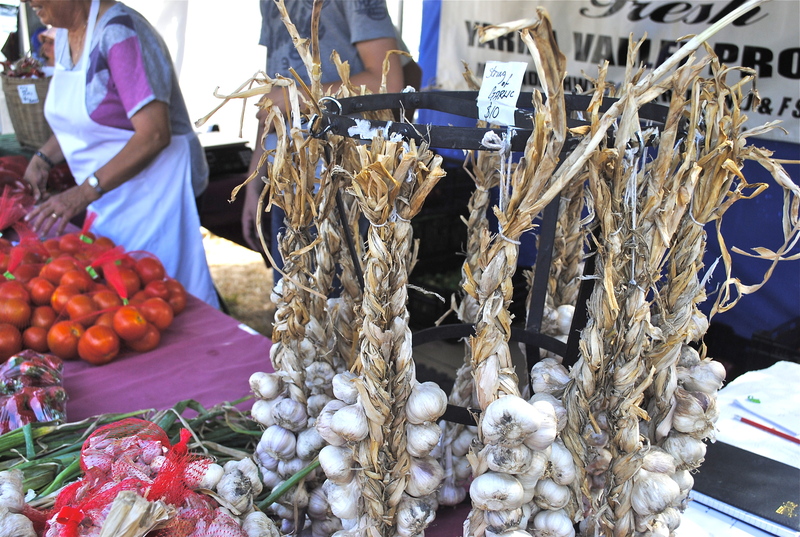 Click here to read more about the community farmer’s markets in Melbourne. It was a hot windy day yesterday at the market. There were probably fewer farmers and food maker stalls than usual, however the array of late summer fruit and vegetables from local farmers was still amazing. As usual, I managed to buy more vegetables than my husband Mark and I could ever eat! I can’t resist beautiful looking vegetables. I bought colourful heirloom carrots, grandfather tomatoes (each weighing over half a kilo! ), a box containing 3 different types of plums, “Bullseye” beetroot (an heirloom variety originally from the Italian town of Chioggia on the Adriatic coast and known as Italian Chioggia) and a gorgeous string of garlic. My father used to make strings (or plaits) with his garlic, and give my sister and I one each one for Christmas presents. You might think a plait of garlic is not a great present, but this was no ordinary garlic; it was fragrant, purple headed garlic that had been organically fertilised all winter. There were about 20 heads on each plait, enough to see me through most of winter. I hope the garlic I bought today at the Slow Food Market is almost as good as my father’s. My favourite and most prized market purchase today was my padron peppers. These green babies are undoubtably my new found love (mio amore). I discovered these gorgeous little peppers at last month’s Slow Food Market. The man I bought them from suggested a simple way to cook them – in a sandwich press. I look his advice and they were so tasty and so easy. I looked around the Victoria Market a few times for them but couldn’t find any – most vendors didn’t seem to know what I was talking about. So I was ecstatic to find them again at the Slow Food Market. Padrons are originally from north west Spain and every tenth pepper is fiery hot. They are delicious and super easy to cook. I am sure you will love them and you will probably be fighting me off at the local farmer’s market for padrons in the next few weeks! Here is the recipe that the man at the Slow Food Market gave me. I had bought around 20 padrons so that we could eat 10 each and if averages are correct, get one fiery one each. To cook the Padron peppers, turn on your sandwich press (if you don’t have one, use a small non stick fry pan). When the plate/pan is warm, throw in the washed padron peppers. Cook for a few minutes until soft. If using a pan, shake it to turn them over so they brown slightly on all sides and soften. Place on a warmed serving plate. Drizzle with good quality olive oil and scatter some sea salt. You can use aioli as a dipping sauce if you like (click here for aioli recipe), or just serve them on their own. Make sure you have a glass of chilled Prosecco or a nice cold beer, like Birra Peroni with them (this way you can cool your mouth if you get a fiery one – I actually got 4 out of the ten I ate! ).